M-16 / AR-15 LULA? 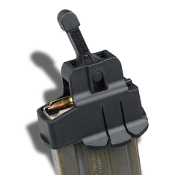 loader and unloader for all such metal and plastic 5.56mm / .223 magazines, including Pmags and Lancer. They may also work with some 6.8mm magazines, but not all.